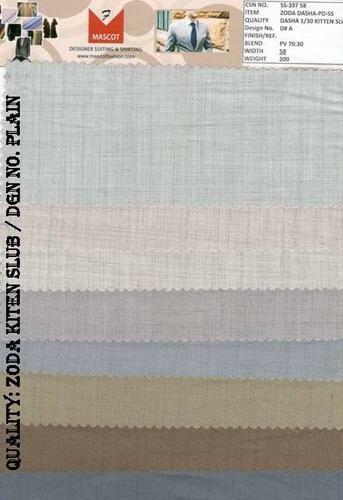 Our company is leading manufacturers , supplier and exporter of Zoda Fabrics. We offer the Zoda Suiting Fabric in various Counts 1/20 pv , 1/30 pv ,2/30 pv , 2/30 x 1/15 pv , 2/40 pv , 2/50 pv , Metty 2/18 pv and 2/60 pv , Kiten slub. We can make as per buyer’s requirement in various weight , blend , weave , finish & width. polysterviscosesuitingfab , polyvisfab , polyvisblendfab , Zoda , Dasha , polyester viscose fabric.